Home / Apollinariya Koprovnik is Coming to Visit! I’m so excited about this! Apollinariya is coming all the way from Slovenia to teach for us. How crazy cool is that? Talk about lucky! She doesn’t come to the US very often. 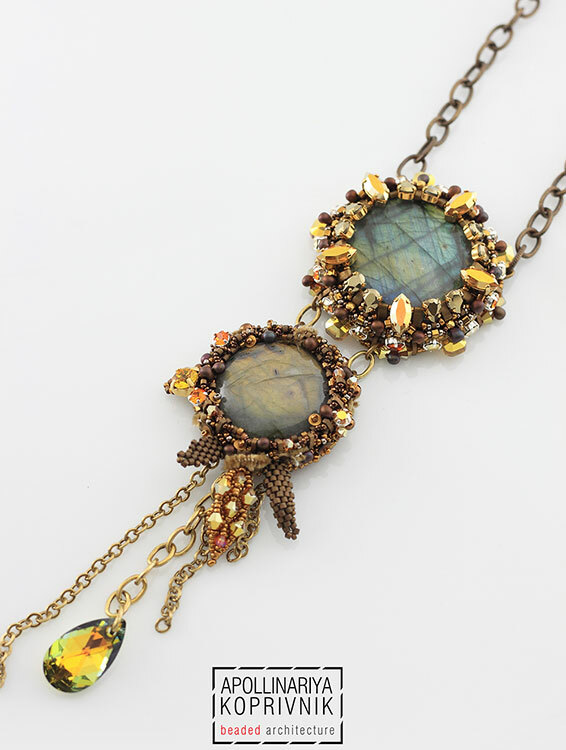 Polina calls her style Beaded Architecture which is the perfect description as it is dimensional! She’s crazy talented with design and color. We are hosting two two-day classes. With this format we will get far enough through the project that we’ll know what we are doing when she goes home. This pendant is amazing and totally on trend. It is partly bead weaving and partly bead embroidery. The cabochons are labradorite. There’s even chenille and sequins mixed in. Fashionable and wearable for fall. Again there are two color choices available; bronze and silver. 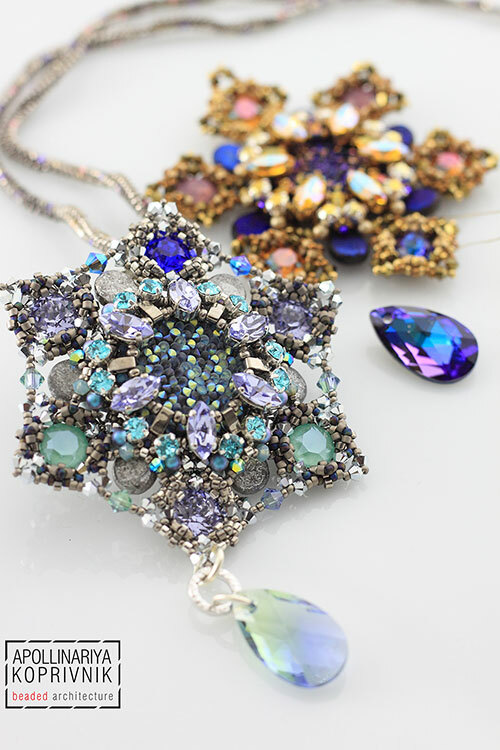 These beautiful snowflakes are completely beadwoven with gorgeous Swarovski crystals and beads. Wear as a necklace or pin or hang on the Christmas tree. Super sparkly. Two color choices are available. Full details are on the website! Click on classes with Visiting Beadwork Teachers for details. You won’t want to miss this one! Give us a call at 410.296.0405 to sign up.